Ylöjärvi parish (Ylöjärven seurakunta) is part of the Evangelical Lutheran Church of Finland. 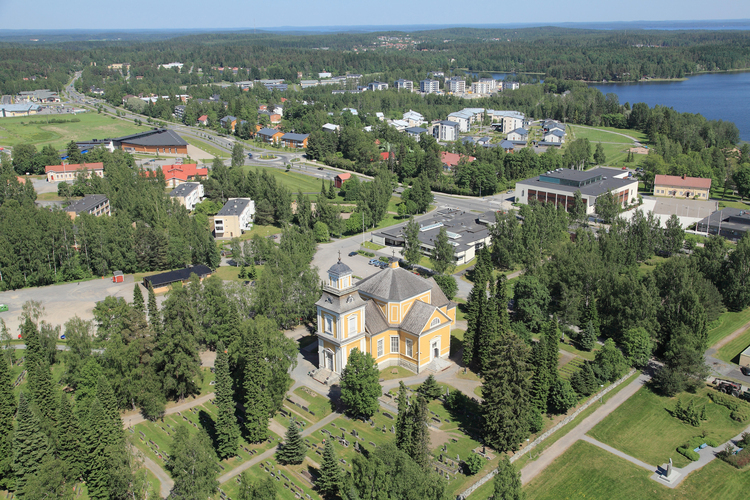 It is situated in Ylöjärvi, which is a town 15 kilometres away from Tampere City. Ylöjärvi parish has over 24 000 members, which means about 80 % of inhabitants in Ylöjärvi town. There is 100 employees in our parish, 10 of those are pastors. Ylöjärvi parish was founded in 1779. The first church was built in 1781. Nowadays there are six churches in Ylöjärvi area. The yearly income of the parish is 6 million euros. Most of it is used to the ministries among children, youth and families. Also diaconial and missionary work are signicant sectors in Ylöjärvi parish. We wellcome you to join everyday life of our congregation! You can check what is happening in our parish from our calendar. There are Sunday services every Sunday basically in three of our churches (Ylöjärvi, Kuru, Viljakkala) . There is also plenty of other action in our parish in weekly basis: junior clubs, Bible study groups, youth evenings etc. For detailed information, please contact Mrs. Jaana Skyttä, tel. +358 44 786 8094 or e-mail us ylojarvi.seurakunta@evl.fi. The first church in Ylöjärvi was built in 1781. However, it got hit by a light bolting in 1842 and, as a result of that, was burnt down. It took some years to start the rebuilding and the present church of Ylöjärvi wasn’t finished until 1850. Many repairs and reconstruction have been made there ever since. The altar painting is painted by R.V. Ekman, a well-known Finnish painter, and was brought to the church in 1870. The organs in the church date from 1990 and have been fabricated in Kangasala. The latest reconstruction in the church was finished in 1997. In summer Ylöjärvi church is open to the public from Mon-Fri from 11am to 5pm. There is also a guide there to show around the church. Kuru church was designed by Matti Åkerblom and the work was supervised by Matti Äkergren. The construction of the church was started in 1781 and the church was inaugurated the same year. In 1848 a sacristy was built on the east side of the church. The organs were built in 1894. The church was last painted in 2001. Kuru Church is open to the public from the end of June to the beginning August every day from 11am to 5pm. There is also a guide there to show around the church. Viljakkala church was designed by C.L. Engel and was built between 1840 and 1842. The interior of the church and the organs were restored in 1989. This church is renowned for its good acoustics. Aurejärvi Church was built in 1924. It was designed by architect Oiva Kallio. There is also a semetary situated close to the church. The construction of the prayer room was set in motion in 1893 and it was inaugurated on 30 June 1898. For the 30th anniversary of the prayer room, a sewing club donated it an altar painting. They have also worked for the maintenance of the prayer room since 1925. Ever since the construction of a belfry in Länsi-Teisko in 1928, the inhabitants of this small village have wanted to have their very own church. However, they couldn’t afford constructing a church and therefore they decided to build a prayer room instead. The design was made by Martti Peltomaa and the prayer room was inaugurated on 25 September 1966.